Click on a chip of desired value to select it. Then click on any bet area on the table to place your bet there (a list of available bets is shown in the Sic Bo Bets section). Every click on the area adds one chip to the bet. Select another chip if you wish to increase the bet by some other amount. Right clicking on the area removes one chip. You can place several chips into several areas at the same time. Click the Roll button. Dice are now rolled and you will see the game result. Click New Game if you wish to play again. Place your bets as described above and click Roll. You can also click Rebet to place the same bet as in the previous round. Clear your bets on the table. Place the same bets as in the previous round. Skip your turn when playing in multi-player mode. To chat with other players (in multi-player mode only), click this button, type your message and then click this button again (or press enter). 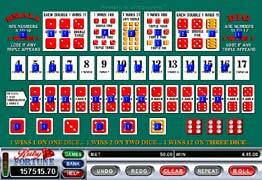 Sic Bo as played in modern Casinos is based on an ancient and very popular Chinese game. The game is resolved by the mechanical rolling of three dice. If your bet wins you will be paid out according to the printed odds on the table. You can place multiple bets per dice roll and thus increase your chances of winning.